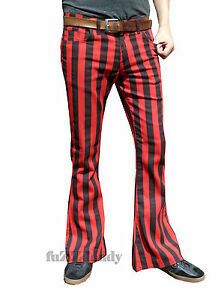 Striped Red & Black material. These beauties have been specifically designed by (proper) flare wearers for flare wearers, and we think we’ve got it just about spot on. 30 30 30 40 40. We make this style in: stonewash (light blue) denim, indigo (dark blue) denim, dark brown cords, light brown cords, navy blue cords, light blue cords, black cords, grey cords, burgundy cords, beige cords, khaki cords.